"Humanity should recognize the valuable assistance offered by the Plejaren extraterrestrials through Billy Meier for solving the most serious problems facing our world today." Matthew Wieczkiewicz, a career aerospace engineer, has publicly endorsed the authenticity of the Billy Meier UFO case, ongoing in Switzerland for over 72 years. 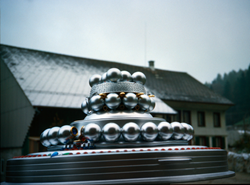 "I first encountered the Billy Meier case when I was studying aviation at ASU, in 1978. I was also interested in the UFO phenomenon, and when the Meier photos were first released, I thought they were intriguing. But I fell for the CIA disinformation campaign, which called them a hoax. So I paid no attention to it for another 30 years, though I maintained an interest in the UFO phenomenon in general. Then, in 2011, I saw an article on a news website that mentioned one of Billy Meier’s claims had come true. So I went back and rediscovered the case and was surprised to see how much information is available compared to 1978. I went in with an open mind and spent the better part of 18 months reading all the material I could find and finally came to the conclusion that it is real," said Wieczkiewicz. Because of his aerospace engineering background, Wieczkiewicz is convinced Meier's UFO evidence is real, such as the newly authenticated 1981 photos of the controversial WCUFO and his 1975 film of the so-called "Pendulum UFO". And he isn't alone. Respected scientists like Michael Mailn (NASA, Mars Mission) and David Froning long ago recognized the authenticity of Billy Meier's UFO evidence and the importance of his information on hyperspace propulsion. Recently, formerly skeptical physician and physicist, Dr. Sanford Weinstein also endorsed Meier's information regarding Russian military movements that he published decades before they occurred. Wieczkiewicz later became interested in Meier's long history of publishing prophetically accurate scientific information. He agrees that recent reports from NASA and US government scientists corroborate Meier's warnings, from as far back as the 1950s, about climate change, global warming and the catastrophic environmental and weather-related consequences already upon us. "Humanity should recognize the valuable assistance offered by the Plejaren extraterrestrials through Billy Meier for solving the most serious problems facing our world today," said Wieczkiewicz. Michael Horn, the American media representative for the Billy Meier case, and Matthew Wieczkiewicz, will co-facilitate multi-media presentations on the evidence, information and documentation on the scientific evidence beginning this fall. Various venues will include colleges, universities and scientific forums. Horn states that many examples of Meier's specific, prophetically accurate information are ironclad, based on copyrights establishing his publication of the information long before "official discovery" and that this is the "higher standard of proof". Horn's new film, And Did They Listen?, is now available internationally.